Corey Peters is a starting Defensive Tackle for the Atlanta Falcons. Last season, arguably the best season of his career, he registered 46 combined tackles and 5.0 sacks. He was drafted by Atlanta in the 3rd Round of the 2010 NFL Draft. Corey was kind enough to take the time to speak with us. 360 Sports Blog: What was it like playing football at Kentucky, a school where basketball is a much greater focus? Corey Peters: It was awesome. Although it’s a basketball school, the fans are very supportive of all athletics. Great people across the state and they treated me well. 360: Describe to me your draft experience and how you felt when you got that call from the Falcons. CP: It was great. I knew as soon as the phone rang. Very emotional to see your dreams come true. 360: What was the greatest moment/experience of your football career (to this point)? CP: Making it to the NFC Championship Game . The dome was rocking! 360: Who’s the toughest offensive lineman you’ve ever had to go against? CP: I’ve played against a few good ones. [Ryan] Kalil in Carolina, [Jahri] Evans in New Orleans, [Nick] Mangold of the Jets, Pouncey of Miami [Mike] and Pittsburgh [Maurkice]. 360: Who is the funniest guy in the Falcon’s locker room? CP: Sean Weatherspoon or William Moore. 360: Based on what you see, and your unique perspective as a player, who do you think is the best prospect in the upcoming NFL draft? CP: I don’t watch enough to have an opinion. However, [Jadeveon] Clowney is a freak of an athlete. 360: On that same token, who do you (realistically) want your Falcons to draft with their first round selection? CP: It doesn’t matter to me. 360: Finally, a little bit off topic, but who do you think will win the NBA Championship? Who are you rooting for? CP: I’ve been a LeBron fan, so I’m rooting for the Heat. 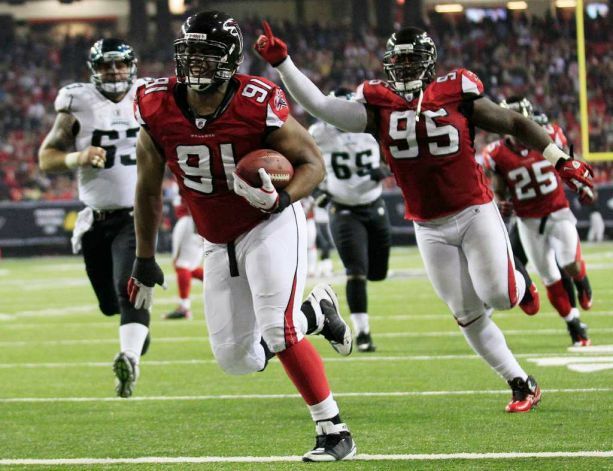 This entry was posted on April 30, 2014 by smarkowitz1 in Analysis, Interviews, NFL and tagged 2010 NFL Draft, 2013 nfc championship game, 2014 nfl draft, 360 interview, Atlanta, atlanta falcons, basketball school, Corey, corey peters, corey peters atlanta falcons, defensive tackle, falcons, falcons locker room, georgia dome, Interview, Jadeveon Clowney, jahri evans, kentucky football, LeBron James, locker room, maurkice pouncey, Miami Heat, mike pouncey, nba championship, nfc championship game, NFL, nfl atlanta falcons, NFL Draft, nfl interview, nfl q&a, nick mangold, q&a, ryan kalil, sean weatherspoon, william moore.